Distressed farmers, disillusioned youth, scared minorities, neglected tribals; alienated middle class have trounced the Bharatiya Janata Party (BJP) in three states of north India by voting Congress back to power. Is it end of the Modi wave? Or is it beginning of an end? Interesting times are ahead as India gets ready to face general election in 2019. The results of the assembly elections held in five states-Rajasthan, Madhya Pradesh, and Chhattisgarh in Hindi heartland, Mizoram in north-east and Telangana in south India, are significant for many reasons. Regional parties dominated in Telangana and Mizoram. The BJP, which was in power for 15 long years in Madhya Pradesh and Chhattisgarh lost to the Congress. In Rajasthan, too, Congress is set to form the government. The big key trend from the result is that the myth of Prime Minister Narendra Modi as the only available alternative has been broken completely. Simultaneously it has led to a resurrection of the principal opposition party, the Congress, under its president Rahul Gandhi who has been able to breach BJP bastion in these key states which accounted for a fifth of all BJP MPs in 2014 elections. Gandhi took over the mantle of leadership from his mother Sonia Gandhi last December. Ever since, his style of leadership and communication had been a subject of ridicule and sarcasm by the saffron party (BJP) and its outfits. Now Gandhi and his party will be taken a little more seriously than before. Also the results have smashed the idea of Congress-free India, a call given by the Prime Minister Narendra Modi in 2014. For three years, it seemed that the nation had heeded his call and the BJP went on to stitch a string of wins in state elections all over India. But, with the elections earlier this year in Karnataka and the latest results have delivered a serious blow to the seemingly unstoppable juggernaut of Modi and the BJP president Amit Shah. Why is the result of these three assembly elections is important? 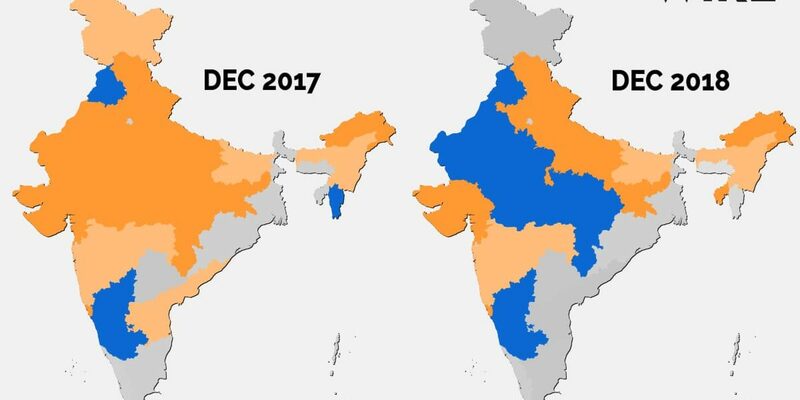 This is because defeat of the BJP in these three states can impact the outcome of Lok Sabha elections due in less than six months. In the 2014 Lok Sabha polls, of the 282 seats were bagged by the BJP 62 came from three states alone. There are serious doubts if the BJP can retain even a significant part of these 62 seats as the outcome of the assembly elections does get reflected in the Parliamentary polls. If the voters’ disillusionment in Rajasthan and Madhya Pradesh travels to bordering Uttar Pradesh that sends 80 people’s representatives to the Parliament, it will put Modi and his team in trouble. Already the Lok Sabha by-elections in that state have not augured well for the BJP. In 2014 Lok Sabha election the BJP won 72 seats from Uttar Pradesh. Also, it is high time for the Prime Minister and his man Friday-Shah to introspect whether the high-decibel hindutva brand of politics will work. Perhaps having realised that the assembly elections may not go its way, the saffron party and its outfits have been testing popular sentiments on building Ram Temple. Remember, the BJP has effectively used the Ram Temple issue to come to power since veteran BJP leader LK Advani began ‘rath yatra’ to raise the consciousness of Hindu majority since late 80’s. At the same time Congress cannot remain complacent. The narrow gap between its vote share and that of the BJP in Madhya Pradesh and Rajasthan is one reason. The Congress bagged 40.9 pc votes, while BJP bagged 41 pc in Madhya Pradesh. Similarly, in Rajasthan Congress bagged 39.3 pc vote share while BJP was down by one per cent at 38.8 pc vote share. So the BJP is far from being written-off in the Hindi heartland. The pre-poll alliances ahead of 2019 General Elections will be crucial. Whether it is the BJP or Congress, the strategic alliances will be to the key to the outcome of the electoral battle next year. Take for instance the in Madhya Pradesh Bahujan Samaj Party had won four seats in the state with 4.6 pc vote share and Samajwadi party had won two seats with one per cent vote share while the Gondvana Gantantra Party- new tribal political outfit had bagged a seat. Similarly in Rajasthan the Congress touched 99 seats two seats lesser required for a majority mark in 200 strong assembly seats. Several anti-BJP political parties too had bagged seats. For instance the Bahujan Samaj Party had bagged five to six seats while the Communist Party of India (Marxist) had bagged two seats while Rashtriya Lok Dal headed by former Union Agriculture Minister Ajit had won a seat. Maya: The New Kingmaker? Also the Bahujan Samaj Party and party supremo Mayawati who has a large following in Uttar Pradesh and in parts of Madhya Pradesh and Rajasthan could be up in for demand. Mayawati will ensure that she gets a best bargaining. TRS, a new ally for the BJP? Having returned to power for a second consecutive term in Telengana will K Chandrashekhar Rao become the new alliance partner for the BJP and a poll ally ahead of Lok Sabha polls. Alliance with TRS will be crucial as the BJP has to compensate for the loss in North India. There is one consolation of the ruling BJP. For the first time the Congress party has been thrown out of political power in all the eight states in the region. Mizoram, the last congress bastion has been taken over by the Mizo National Front that has won 26 out of the 40 seats while Congress was reduced to five seats. The MNF is constituent of the north-east Democratic Alliance a political coalition formed by BJP in May 2016 to free region from Congress rule. Indian politics is in a state of churning. How long the coalition partners in the ruling National Democratic Alliance will remain with the BJP is to be seen as many coalition partners have been increasingly unhappy with Modi’s leadership. Secondly how many of the regional parties would like to align with BJP as they may perceive it to be on a decline. Already a junior minister and leader of NDA-constituent Rashtriya Lok Samata Party (RLSP) Upendra Kushwaha quit government. Kushwaha also quit the BJP-led NDA, charging Prime Minister Narendra Modi of betraying Bihar. Simulataneously, the opposition coalition seems to be taking some concrete shape after months of discussions. Sonia Gandhi and Rahul Gandhi of the Congress, Nationalist Congress Party chief Sharad Pawar, Trinamool Congress supremo Mamata Banerjee, MK Stalin of the Dravida Munnetra Kazhagam (DMK) and Arvind Kejriwal of the Aam Aadmi Party (AAP) met in the national Capital on Monday. Political formations have once again started to get rearranged. However, crucially for the Congress, Akhilesh Yadav of Samajwadi Party and Mayawati-BSP chief were absent. It is these two parties that can stop the BJP juggernaut in Uttar Pradesh. Will the opposition platform retain the traction to fight the BJP? Or Will Modi who is the sole election campaigner for the BJP bring back the saffron party power? Unlike the 2014 elections, the next round in 2019 will not be a cakewalk for the BJP or the opposition. Nevertheless interesting times ahead for India and India watchers!